Why do you need a balance? Simple. They both serve a different purpose. Let’s break it down. The unique content you create, like this blog post for example, works its magic in a few ways. One, it drives traffic back to your site from when you share it and from when others share it. That’s where your conversions and leads happen. The problem with unique content is that it takes a toll. It’s time consuming, could be costly, and sometimes misses the mark. http://blogs.constantcontact.com/what-is-content-curation/ However, the pros of unique content far outweigh this. Unique content is yours, you own it, you share it and others share it too making it a powerhouse for marketing and lead generation purposes. You need unique content. You need it badly. And for those times where you just can’t get something out there fast enough, curation can fill in the gap. Content you curate is also powerful because it can make you a thought leader. If used correctly and has the right voice and tone for your customers and audience it can still be shared by others increasing your reach and relevance. Plus, sharing curated content gives you the opportunity to build relationships with other content creators and influencers. The best kid of curated content is trending content. This is stuff that is already being shared online. I have noticed when I share trending content vs any old content, it gets more views, likes/reactions and shares. This is the sweet spot. So how do you find it? The best place to look is on social networks. You will have a good idea of what is trending by what you see on your feed. As a business owner, it is important to like and follow pages that are relevant and those that your audience and customers like so you can connect with them on similar topics. It shows you are your audience and when you like the same thing, it makes sharing content that much easier. Here are the places I do my trend forecasting and sharing. Facebook is king for finding content that is making its way around the internet. Often times you will see a lot of people sharing the same thing. This is a good sign that something is trending and people are enjoying it. You can also use Facebook search as it shows you just how many people are talking about something. If a lot of people are talking about it, it is hitting people where it counts. That’s a good sign too. Twitter is another network that is great for finding content that is making the rounds. You can look at trending conversations and moments for a good roundup. You can also use the search tool and usually the see what posts are getting the most action by the amount of favorites and retweets. If something has a high number for these values you can assume it is good to share. I use Instagram a little bit differently. Instead of looking for content to share that is being engaged with, I like to search for posts with my clients’ products featured and reshare that. User-generated content is powerful and this is a good way to show others it is cool to post about your business, product and/or service. I love Buzzfeed, ok I admit it, I take way too many of their quizzes. I’m a sucker for them. Judge me. I can handle it. 🙂 Buzzed is great to search on the trending section, especially if you have a lifestyle business. Buzzfeed content is fun and people like to share it, obviously. BuzzSumo is a site where you can search and find trending content based on how many shares it has received across all social sites. Not only is it very complete, it also allows you to filter by date, language and content type. So if you only want images from the past week, you can do that. Need more inspiration? Here’s a great list. Oh and by the way, aim for a 70:30 ration of unique to curated content. Remember, the traffic to your site is most crucial so focus there when you can. 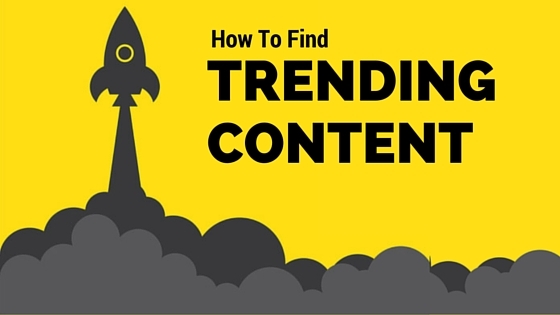 Where do you find trending content.